The House of Representatives has unanimously approved House Bill (HB) 7652, also known as the Mobile Number Portability Act, on third reading on Monday, September 10. The proposed law requires telecommunication companies to give users the option to retain their old mobile numbers should they choose to switch from one service provider to another. The act also covers users who want to switch their subscription plans between prepaid and postpaid. “The basic premise behind a nationwide Mobile Number Portability system is to promote consumer welfare as it fosters the freedom to choose and to respond to quality, price and other relevant considerations without the consumers having to change their mobile numbers whenever they change service providers,” HB 7652 reads. The bill details that the service must be provided for free, and that the porting process must be completed within 24 hours. However, after a mobile number has been ported, its user can only go through the porting process again after 60 days. 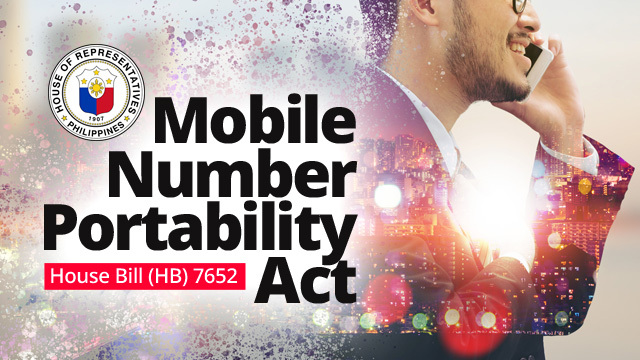 The House’s approval of HB 7652 comes several months after the Senate approved its version of the act, Senate Bill 1636 or the Lifetime Cellphone Number Act. Both versions propose similar rules and regulations with regards to the porting process. With both versions of the act approved, the bicameral conference committee will then meet on the measure and agree on a common version. After it is ratified by the Senate and the House, it will have to be approved by President Rodrigo Duterte before it becomes an official law. The bill is seen to benefit the country’s 61 million mobile users, which on average have two mobile numbers each, according to social media agency We Are Social. It also aims to promote competition among telecommunications firms by giving mobile users the freedom to easily choose services across different providers.